An American icon, Pinehurst was created as a holiday village and winter health retreat by Massachusetts entrepreneur James Tufts, following his 1895 purchase of thousands of acres within the vast North Carolina sandhills. Capitalizing on the growing popularity of golf, he soon added a rudimentary golf course to his property and then, in 1900, appointed Scotsman Donald Ross as its head professional. 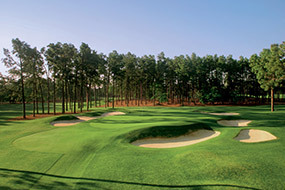 For golfers this is where the Pinehurst story really begins, as Ross remained in the village for almost half a century and not only reshaped these barren sandhills into a world-class golf destination but grew an architectural practice that was responsible for more than 400 completed projects across the country. Since his death in 1948, volumes have been written on Ross and his influence within the US golf industry. 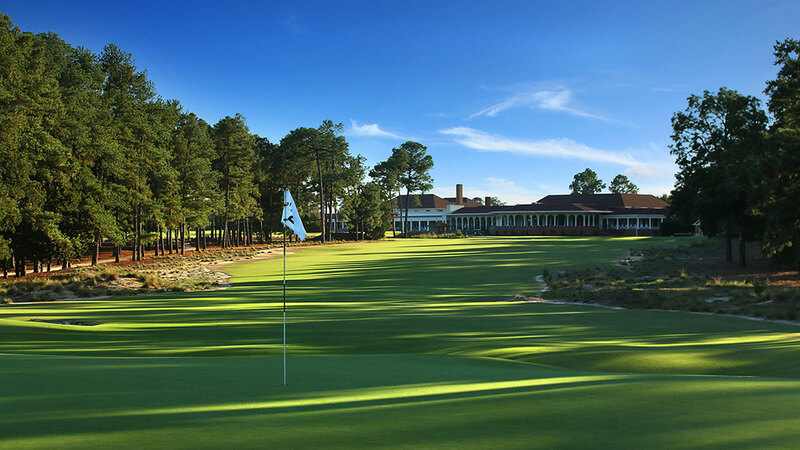 Pivotal to the telling of every tale is Pinehurst and its legendary No. 2 Course, which he first designed in 1907 and initially built with sand greens that were flat, square and uncontoured. He then spent many years experimenting with the layout, moving greens and testing internal putting contours. It wasn’t until 1935 that he completed the routing and grassed all of his greens, finally satisfied that he had a Bermuda strain capable of surviving the harsh Carolina summers. With some exceptions, the course is laid out across fairly unremarkable terrain, but in a strange way this allowed Ross to enhance his holes by building features that he may have been reluctant to create on a more natural piece of ground. From the tee No. 2 is reasonably generous and lined by vast areas of native sand. These waste areas were restored by Bill Coore & Ben Crenshaw, and have elevated the look and feel of the course above the previous wall-to-wall lawn style. Despite the quality of the work and the appeal from the tee, No. 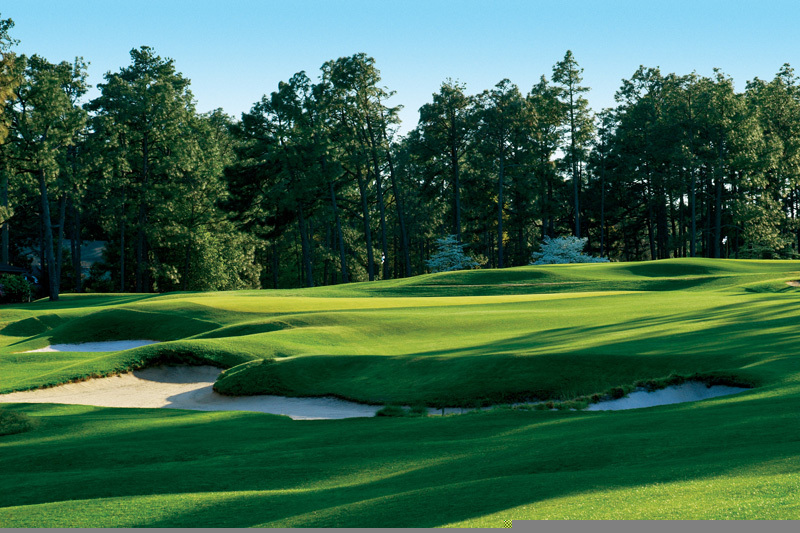 2 is very much a second shot course and best known for its famous turtleback greens. Pushed-up and generally falling away on all sides, what makes these targets so formidable are the small ridges, humps and crests that cut across the putting surface to make the actual target areas even tighter. The mental battle here is continually about balancing the penalty awaiting a long approach shot with the desire to hit beyond the raised frontal areas. For those conditioned to hit at pins, and slightly off their game, it can seem a brutal and repetitive test as a miss generally leaves a nasty chip or putt back up a sharp slope and onto a quick green that is tilted away from play. While not the greatest test from the tee in American golf, No. 2 doesn’t really have any major flaws as the distinctive targets help to rescue anything potentially uninteresting. Better holes include the mid-length 3rd, its shallow green requiring real finesse to hit and hold, and the par five 5th, which climbs a ridge and then features an awesome second shot into a rising green angled across the fairway and with a narrow central pinable shelf. The next stretch of holes are also very strong, the highlight being the approach into the 7th and the cross-valley par three 9th, with its elevated target split by a pronounced tier. On the back nine, the long 10th and clever mid-length par fours at the 12th and 13th are outstanding as are the two par threes. The short 15th is defended by the smallest green on the course and the beautifully bunkered 17th by an angled target that narrows the farther back the pin is pushed. Following this gem is a classic closing four, the hole leaning and turning a little to the right and featuring a green site with a clever diagonal swale and plenty of sharply breaking putts. Although there have been few structural alterations made since Ross’s passing, whether today’s course would totally please him is unclear. He would certainly appreciate the return of the native sandy roughs and the removal of the grassed lips on many of his bunkers. What might concern him are the green contours and speeds. There is a suggestion that, due to topdressing during those earlier decades, the distinctive dome-shaped greens are more pronounced than Ross had ever intended. It is also important to note that the putting surfaces were first converted to bentgrass in the early 1970s, and that Ross certainly never designed them with modern green speeds in mind. These points aside, Pinehurst was one of the pioneers of early American golf and the success of its No. 2 course, as well as the story of its revered creator, are inextricably linked. Although Ross was the man who put the resort on the golfing map, without Pinehurst we may never have seen his eye for design materialize into architectural genius.